Giuseppe Castiglione (chữ Hán: 郎世寧, Hán Việt: Lang Thế Ninh; 1688 - 1766) là 1 tu sĩ Dòng Tên người vùng Milano, nước Ý đã theo phái bộ truyền giáo tới Trung Quốc năm Khang Hi thứ 54 (1715) và được giữ lại làm họa sĩ cung đình. Bản thân ông cũng đã dạy cho các họa sĩ Trung Hoa các kỹ thuật hội họa của Châu Âu. Giuseppe Castiglione qua đời tại Bắc Kinh năm 1766, hưởng thọ 78 tuổi. Ông đã được vua nhà Thanh là Càn Long phong hàm Thị lang và được chôn cất trong nghĩa trang dành cho các giáo sĩ tại Bắc Kinh. Robert Loehr, Giuseppe Castiglione (1688–1766) pittore di corte di Ch’ien-Lun, imperatore della Cina (Rome: ISMEO, 1940). George Robert Loehr, “European Artists at the Chinese Court,” in The Westward Influence of the Chinese Arts from the 14th to the 18th Century, ed. William Watson, Colloquies on Art & Archaeology in Asia, no. 3 (London: Percival David Foundation, 1972): 333–42. Joseph Deheregne, Répertoire des Jésuites de Chine de 1552 à 1800 (Rome: Institutum Historicum S. I., 1973), 95. Willard Peterson, “Learning from Heaven: the introduction of Christianity and other Western ideas into late Ming China,” in The Cambridge History of China, ed. Denis Twitchett and Frederick W. Mote, 15 vols. (Cambridge: Cambridge Univ. Press, 1988), 8:789–839. Cécile Beurdeley and Michel Beurdeley, Giuseppe Castiglione: A Jesuit Painter at the Court of the Chinese Emperors (London: Lund Humphrey, 1972). Hongxing Zhang, ed., The Qianlong Emperor: Treasures from the Forbidden City (Edinburgh: NMS, 2002). Evelyn Rawski and Jessica Rawson, China: The Three Emperors 1662–1795 (London: Royal Academy of Arts, 2005). John W. O’Malley et al., eds., The Jesuits: Cultures, Sciences, and the Arts 1540–1773, (Toronto: Univ. of Toronto Press, 1999). Ho Wai-kam, ed., Eight Dynasties of Chinese Painting: The Collections of the Nelson Gallery-Atkins Museum, Kansas City, and the Cleveland Museum of Art (Bloomington: Indiana Univ. Press, 1980), 355. Memoria Postuma Fratris Josephi Castiglione, Bras. 28, ff. 92r–93v, Archivum Romanum Societatis Iesu (ARSI), Rome. Georg Pray, ed., Imposturae CCXVIII. in dissertatione R. P. Benedicto Cetto, Clerici Regularis e Scholis Piis de Sinensium Importuris Detectae et convulsae. Accedunt Epistolae Anecdotae R. P. Augustini e Comitibus Hallerstain ex China scriptae (Buda: Typis Regiae Universitatis, 1791). Marco Musillo, “La famille de Giuseppe Castiglione (1688–1766)”, (Paris: Thalia Edition, 2007). Marco Musillo, “Les peintures génoises de Giuseppe Castiglione”, (Paris: Thalia Edition, 2007). Michèle Pirazzoli-t’Serstevens, Giuseppe Castiglione 1688-1766: Peintre et architecte à la cour de Chine (Paris: Thalia Edition, 2007), 18–25. Marco Musillo, “Bridging Europe and China: The Professional Life of Giuseppe Castiglione (1688–1766)” tesi di dottorato (University of East Anglia, 2006). Marco Musillo: "Reconciling two careers: the Jesuit Memoir of Giuseppe Castiglione lay brother and Qing imperial painter" in Eighteenth-Century Studies, vol. 42, no. 1 (2008) Pp. 45–59. Antonio Franco, Synopsis Annalium Societatis Jesu in Lusitania ab anno 1540 usque ad annum 1725 (Lisbon: Real collegio das artes da Companhia de Jesus, 1760), 441; e Imagem da Virtude em o Noviciado da Companhia de Jesus do Real Collegio do Espirito Santo de Evora (Lisbon: Real collegio das artes da Companhia de Jesus, 1714), 57. Relazione scritta da Monsignor Vescovo di Pechino al P. Giuseppe Cerù, in ordine alla Publicazione de Decreti apostolici (1715), ms. 1630, ff. 146r–152v, f. 149r. Biblioteca Casanatense, Rome. Copie manoscritte di vari scritti del Servo di Dio Matteo Ripa (1874), Cina e Regni Adiacenti Miscellanea 16, f. 21r, 26 December 1715, APF, Roma. Yang Boda, “The Development of the Ch’ien-lung Painting Academy,” in Words and Images, ed. Alfreda Murck and Wen C.Fong (New York: Princeton Univ. Press, 1991), 333–56, 345. George Robert Loehr, “Giuseppe Castiglione,” Dizionario Biografico degli Italiani (Roma: Istituto della Enciclopedia Italiana, 1970), 22:92–94, 93. Father Jean Sylvain de Neu-vialle (Newielhe, 1696–1764) Relaçao da jornada, que fez ao Imperio da China, e sumamria noticia da embaixada, que deo na Corte de Pekim Em o primeiro de Mayo de 1753, o Senhor Francisco Xavier Assiz Pacheco e Sampayo (Lisbon: Officina dos Herd. De Antonio Pedrozo Galram, 1754), 8. Edward J. Malatesta and Gao Zhiyu, eds., Departed, yet Present. Zhalan the Oldest Christian Cemetery in Beijing (Macau and San Francisco: Instituto Cultural de Macau and Ricci Institute, 1995), 217. Lo-shu Fu, A Documentary Chronicle of Sino-Western Relations (1644–1820), 2 vols. (Tucson: Univ. of Arizona Press, 1966), 1:188–89. Ishida Mikinosuke, “A Biographical Study of Giuseppe Castiglione (Lang Shih ning) a Jesuit Painter in the Court of Peking under the Ch’ing Dynasty,” Memoirs of the Research Department of the Toyo Bunko, no. 19 (1960): 79–121, 88–90. Lang Shining xiaozhuan (Short biography of Lang Shining) in "Gugong bowuyuan yuankan", n. 2, 1988, pp. 3–26, 91-95. Aimé -Martin, M. L. (ed.) Lettres édifiantes et curieuses concernant l'Asie, l'Afrique et l'Amérique, avec quelques relations nouvelles des missions, et des notes géographiques et historiques, Paris 1838-1843, vol. II, III, IV. Beurdeley, C. et M., Castiglione, peintre jesuite a la cour de Chine, Fribourg 1971. Chayet, A., Une description tibétaine de Yuanmingyuan, in Le "Yuanmingyuan". Jeux d'eau et palais européens du XVIIIe siecle a la cour de Chine, Paris 1987. Cheng, T. K., Chinese Nature Painting, in "Renditions", n. 9, spring 1978, pp. 5–29. Durand, A., Restitution des palais européens du Yuanmingyuan, in "Arts Asiatiques", vol. XLIII, 1988, pp. 123–133. 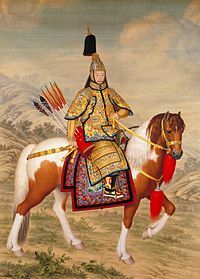 Hou Jinlang- Pirazzoli, M., Les chasses d'automne de l'empereur Qianlong à Mulan, in "T'oung Pao", vol. LXV, 1-3, pp. 13–50. Hucker, C., A Dictionary of Official Titles in Imperial China, Stanford 1985. Jonathan, P.-Durant, A., La promenade occidentale de l'empereur Qianlong, in Le "Yuanmingyuan". Jeux d'eau et palais européens du XVIIIe siecle a la cour de Chine, Paris 1987, pp. 19–33. Ju Deyuan-Tian Jieyi-Ding Qiong, Qing gongtong huajia Lang Shining, in "Gugong bowuyuan yuankan", n. 2, 1988, pp. 27–28. Kao Mayching, M., China's Response to the West Art: 1898-1937, Ann Arbor, Mich. 1972. Lettres édifiantes et curieuses, écrites des Missions Etrangères, Nouvelle edition, Paris 1781, vol. XXII, XXIII, XXIV. Liu Pinsan, Huama he Lang Shining "Bajuntu" in "Gugong bowuyuan yuankan", n. 2, 1988, pp. 88–90. Nie Chongzheng, Lang Shining, Beijing 1984. Trang này được sửa đổi lần cuối vào ngày 21 tháng 9 năm 2018 lúc 10:38.